← Got Poles? Now What Do You Do? It’s always more fun in a group and there are several weekly group walks as well as some that meet monthly or are just a special one time walk. So no excuses for not getting out with your poles! 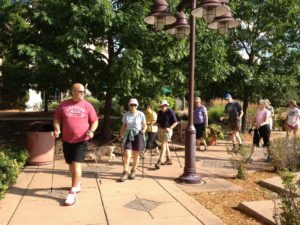 Weekly walks include: Monday’s in Sauk Rapids, Tuesday’s in Cold Spring and with Hoigaards, Wednesdays with Fridley and Maple Grove Senior Community Ed, Thursdays in St Cloud and Fridays you’re on your own! Through Pedal and Roll for Parkinson’s Liz and I are scheduling monthly group walks with Parkinson’s support groups. We know what a walk can do to help rekindle excitement and motivation to keep walking! These walks are a follow up to all of our visits to these groups over the past 4 years. 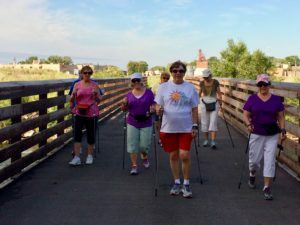 We have presented to groups throughout the Twin Cities, down to Hastings and Rochester, and as far as Alexandria and Fargo with the message that Movement is Medicine and the bikes and poles will help you to keep moving. I’m updating my Facebook page to show scheduled events for all of our walks. Please be patient but if you have questions don’t hesitate to contact me. We will also be posting a full schedule of walks for Parkinson’s on the National Parkinson Foundation MN website and social media page. Check back often as walks are being added almost every day. This entry was posted in HOW, Nordic Walking, Uncategorized, Upcoming Events and tagged Nordic Walking groups, Parkinson's Nordic Walking, Pedal and Roll for Parkinson's, Walking groups. Bookmark the permalink.